The United Kingdom has welcomed home its first four F-35B Lightning II advanced fighter aircraft, which will be flown by the Royal Air Force (RAF) and Royal Navy. With the aid of air-to-air refueling, the aircraft flew non-stop across the Atlantic from the U.S. Marine Corps Air Station in Beaufort, South Carolina where UK pilots have been undergoing intensive training on the aircraft in partnership with their USMC counterparts. With stealth technology, advanced sensors, weapons capacity and range, the F-35 Lightning II is the most lethal, survivable and connected fighter aircraft ever built. More than a fighter jet, the F-35’s ability to collect, analyze and share data is a powerful force multiplier enhancing all airborne, surface and ground-based assets in the battlespace. «This aircraft will truly transform how the UK conducts its defence operations and it is fitting that the next generation of combat air power has arrived as the RAF celebrates its centenary», said Peter Ruddock, Chief Executive, Lockheed Martin UK. «As a key partner in the F-35 programme from its early stages, the UK has been instrumental in shaping the design and development of the aircraft, particularly in relation to the short take-off and vertical landing capabilities». The programme has also greatly benefitted UK industry with more than 500 British companies involved in the supply chain. 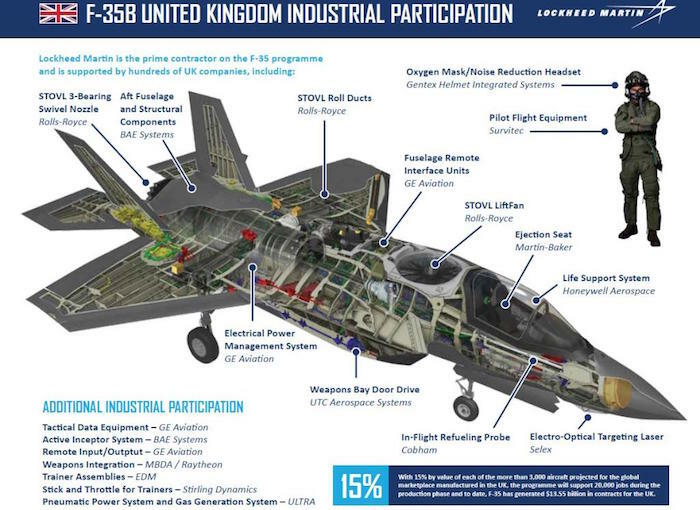 Around 15 percent by value of each of the more than 3,000 F-35 Lightning II aircraft projected on the programme is manufactured in the UK, and to date the programme has generated about U.S. $13 billion in contracts for British suppliers. Comprehensive sustainment support for the UK’s fleet of F-35 Lightning II aircraft based at RAF Marham will be provided by Lightning Team UK, which represents the blended industry team of BAE Systems, Lockheed Martin, Pratt & Whitney and Rolls Royce. The UK currently has 15 F-35B Lightning II aircraft in total, the remainder of which are stationed at Marine Corps Air Station (MCAS) Beaufort or Edwards Air Force Base in California, where they are involved in testing and training. Around the world, there are now nearly 300 F-35 Lightning II aircraft operating from 15 bases globally and the programme has achieved more than 140,000 flight hours.